~~GuRu bHaI~~: What the hell is this "SecuLariSm" ?! What the hell is this "SecuLariSm" ?! "Secularism" - the term which has been getting coined and redefined by the politicians and bureaucrats these days make us to google the crux meaning of the word. It has been actually defined by the British writer George Holyoake in 1851. He has stated it as "Secularism is the belief that government or other entities should exist separately from religion and/or religious beliefs." And of course, this secularism plays a core role in framing the wise governance in the huge democratic land like India which has vast religions and numerous beliefs. Government is supposed to use this weapon with keen projection. But what is happening here? Do the people in saffron or hats over head or Christ in the chest are all vouchsafed here with equal priorities and privileges? I really don't think so. Whenever you find a local riot in your place which might not necessarily be a religious one and if you were accidentally found nearby with a saffron indication anywhere in your attire, you would be alleged to be a cause for that and will be arrested with no discrimination. Whenever you find a gunfire or bomb blast at a social place and if you were again accidentally there with a hat on your head with a beard, you would again be alleged and arrested as a terrorist with no discrimination again. This is how Democracy is being defined these days ! Denial to these happenings would merely be an absurd. And this is what is said to be a secular treatment by the government of India for the past few decades. Undoubtedly, these horrible causes of those lawless flawful, misconceptive actions then become sources for those many new anti-govt and terrorist groups across all parts of the country which mainly focus in disturbing the life of a common man. Again they show their retaliation by means of hindrances to the rest innocent people of the nation by doing some merciless attacks over them. Various laws and acts might be gone live in upholding the status of those people belonging to the minority religions in the society but still we are not in a position to say firmly that India can safeguard the welfare of all communities of people. Riots of Mumbai or Gujarat, Godhra Massacre and many other miseries took place in the Indian history and what is happening everyday at J&K and other north eastern states are adding bitterness to the Indian democracy and the nation's pride as well. These oracular happenings are also caused because of those so called supposedly principled religious wary leaders who stand out of their responsibilities and motivate their followers in totally an awful way. All those governments who rule us spend most of the time in thinking on making politics with these issues rather spending time in resolving, despite the fact whether it is UPA or NDA. Ruling Parties would keep on convincing us and opponent parties would keep on conflicting us. But none of them would step up to solve the core crusades ! Vote bank matters for the both. Where this will end up ? Is the government only the criterion to bother this or the chary people who take the privilege of designing our government should bother about this? Many more questions are becoming rhetoric when we start thinking of the things that are going to happen in the offing. 13/7 is the latest down front which has ditched the biggest democracy into a landmine. Watchdog of all these consequences, so called the “media of today” is kindling the minds of people and making them ambivalent since they are not engendering the coveted facts behind the anguish causes happening in the country. Instead, they want their TRPs being competent with their counterparts. Their duty is not only to bring the things happening in the globe “as fast as possible” but “as true as possible” too. Most of the time, the latter is not being considered by them. Mere exaggeration helps them in raising their commercial TRPs. So, this might keep them away from reflecting the actualities despite the facts. Anyways, one thing is very Lucent and transparent. Going ahead, secularism will hardly be existing in this world’s largest democracy. So, unless we turn up against this in the near future, the life of an “Aam Aadhmi” will be screwed like anything. Despite all these things, I just wanna tell one thing to the people of India. Please never abhor our brothers and sisters on considering the mal-facts ! Developing hatred will kick us back one day in the offing for sure. So, it is better to start a renaissance in the country just like the Jan Lok-Pal against corruption. 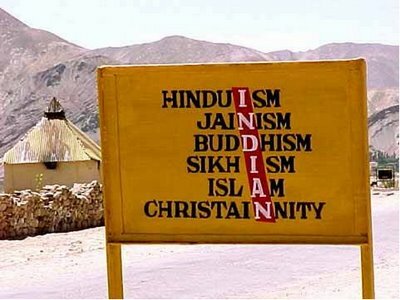 Until, all kinds of people here walk with their own pride and prestige of their religion, India cannot be considered as a “Secular Country”. AWAKE and ARISE please ! Its not TOO LATE.